Abstract Standard methods for quantifying GHG emissions from soils tend to use either micrometeorological or chamber based measurements approaches. The latter is the most widely used technique, since it can be applied at low costs and without power supply at remote sites to allow measurement of GHG exchanges between soils and the atmosphere for field trials. Instrumentation for micrometeorological measurements meanwhile is costly, requires power supply and a minimum of 1 ha homogeneous, flat terrain. In this chapter therefore we mainly discuss the closed chamber methodology for quantifying soil GHG fluxes. We provide detailed guidance on existing measurement protocols and make recommendations for selecting field sites, performing the measurements and strategies to overcome spatial variability of fluxes, and provide knowledge on potential sources of errors that should be avoided. As a specific example for chamber based GHG measurements we discuss sampling and measurement strategies for GHG emissions from rice paddies. Microbial processes in soils, sediments and organic wastes such as manure are a major source of atmospheric greenhouse gases (GHG). These processes create spatially as well as temporally heterogeneous sources or sinks. Consequently, a thorough understanding of the underlying processes and a quantification of spatio-temporal dynamics of sinks and sources are the bases for a) developing GHG inventories at global, national and regional scales, b) identifying regional hotspots and c) developing strategies for mitigating GHG emissions from terrestrial, specifically agricultural, systems. At the ecosystem scale, biosphere-atmosphere fluxes of CO2, CH4, and N2O are bi-directional, i.e. what is observed is a net flux of production and consumption processes (e.g. CO2: photosynthesis and autotrophic and heterotrophic respiration; CH4: methanogenesis and methane oxidation; N2O: nitrification and denitrification as source processes and denitrification as a sink process). The same is true for soil-atmosphere exchange processes, though, with regard to CO2, often only respiratory fluxes are measured. Approximately 2/3 of all N2O emissions are linked to soil and manure management (Fowler et al., 2009 ; IPCC, 2013 ). For CH4 as well, soils and organic wastes strongly influence atmospheric CH4 concentrations. It is estimated that wetland and paddy soils represent approximately 1/3 of all sources for atmospheric CH4 (Fowler et al., 2009 ). On the other hand well-aerated soils of natural and semi-natural ecosystems – and to a lesser extent soils of agro-ecosystems – are sinks for atmospheric CH4; removing approximately 20-45 TG yr-1 of CH4 from the atmosphere (Dutaur and Verchot, 2007 ), which corresponds to approximately 6-8% of all sinks for atmospheric CH4 (Fowler et al. 2009 ). For CO2, soils are a major source due to autotrophic (plant root) and heterotrophic (microbial and soil fauna breakdown of organic matter) respiration. However, at the ecosystem scale, soils can act as net sinks as well as sources for CO2, since at this scale plant primary production (CO2 fixation from the atmosphere by photosynthesis), litter input to soils as well as respiratory fluxes are considered. It is well established that soils to a depth of 1 m globally store approximately 3 times the amount of carbon currently found in the atmosphere (Batjes, 1996 ; IPCC, 2013 ). Thus, land use and land management changes, as well as changes in climate affect plant primary production and fluxes of litter to the soil and soil organic matter mineralization dynamics. This can either result in a mobilization of soil C and N stocks, or, with adequate management, turn soils into C sinks. The latter is an essential process for removal of atmospheric CO2 and climate protection and has been called the “recarbonization” of our terrestrial ecosystems (Lal, 2009 ). Due to the mostly microbiological origin of soil, sediment and organic waste GHG emissions, changes in environmental conditions directly affect the exchange of GHG between terrestrial systems and the atmosphere (Butterbach-Bahl and Dannenmann, 2011 ). Changes in temperature affect enzyme activities, while changes in redox conditions – as influenced by soil aeration fluctuations as a consequence of changes in soil moisture – can favor sequentially different microbial processes. For example, field irrigation and water logging as a standard management for rice paddies, results in anaerobic soil conditions, thereby slowing down and stopping aerobic decomposition processes, while sequentially initializing a series of microbial processes that use other elements and compounds than oxygen as an electron acceptor: first NO3– (denitrification), followed by SO4– and Fe3+ and Mn3+/4+ reduction, before finally CH4 is produced as a product of organic matter degradation under strictly anaerobic conditions by methanogens (Conrad, 1996 ). Fig. 4.1 General recommendations for chamber placement, gas sampling, gas concentration measurements and measurement of auxiliary parameters for static chamber soil GHG flux measurements. (Note: text in italic are additional measurements/ parameters which might be worthwhile to observe) Images are labeled a,b,c,d starting with the top left and going clockwise. Environmental conditions not only change naturally across days, seasons and years as a consequence diurnal and seasonal temperature rainfall regimes, but also due to management of agricultural (forest with regard to plantations) land, as was explained above with the example of flooding of paddy fields. Changes in environmental conditions affect the activity of the microbial community as well as that of plants, and consequently, the associated GHG production and consumption processes. Thus, GHG emissions from soils show a rather pronounced temporal variability on short (diurnal) and longer (days to weeks and years) timescales (e.g. Luo et al. 2012 ). Moreover, environmental conditions also change on spatial scales because soil conditions, plant cover, land management and thus, nutrient availability, soil aeration and microbial community composition, also change across microscale (e.g. soil matrix) to landscape and continental scales. As a result, GHG fluxes also vary considerably across spatial scales, making it necessary to develop a solid sampling strategy to target measurement sites, i.e. determine which sites are representative for the landscape one would like to work in, for estimating GHG fluxes and develop strategies to mitigate those emissions. Targeting (Chap. 2 of these guidelines) is a cornerstone to allow meaningful upscaling to landscape and higher spatial scales. But targeting already starts at the measurement site, since decisions have to be made where (and when) to place chambers for flux measurements (Fig. 4.1a). This chapter does not aim to provide a cookbook of how to measure soil and manure GHG fluxes. Plenty of work has been published on this topic, filling bookshelves and libraries (see e.g. Table 4.1). Here, we will provide guidance to the relevant literature and highlight potential problems that might come up when designing a GHG measurement program (Fig. 4.1) rather than be specific and explain the sampling procedures in detail. We also provide examples how to overcome problems in the context of GHG measurements for smallholder systems. 4.2 What technique is most suitable for measuring biosphere-atmosphere exchange processes of GHG’s? The two most commonly used techniques for measuring fluxes between terrestrial ecosystems and the atmosphere are: a) enclosure based (chamber) measurements (manual or automated), and b) micro meteorological measurements (e.g. eddy covariance or gradient methods) or a combination of both (Denmead, 2008 ). The choice of the measurement technique itself is largely driven by resource investment, demand and by the research question. Use of micro-meteorological techniques requires homogenous fields with a significant fetch (>1 hectare) that should not be influenced by buildings, trees, slopes etc. Land use, land management, vegetation and soil properties should be homogenous for the direct fetch area, but also for the wider area. Typically these techniques are applied in flat terrain with large, homogenous land use, such as pasture, grassland, maize or wheat mono-crops, forests, or tree plantations. Capital costs of micro-meteorological measurements of GHG fluxes are high, since the required sensors (3-d wind field, fast-response gas analyzers) plus auxiliary instruments (meteorological station, mast, etc.) for flux measurements at one site, for CO2 and energy fluxes only, cost around 60,000-80,000 USD Adding other components, such as CH4 (open path sensors are available) and N2O (requiring laser spectroscopy instruments), requires a significant additional investment in instruments (starting from 30,000-40,000 USD per gas). Energy supply for the instruments (if not only focused on open path CO2/H2O/CH4 technology) is another constraint that should be considered. The two most prominent global networks for multi-site and multi-species observations of biosphere-atmosphere-exchange of GHG’s using micro-meteorological methodologies at least for CO2 fluxes are the National Ecological Observatory Network (NEON) in the USA (http://neoninc.org/ ) and the Integrated Carbon Observation Network (ICOS) in Europe (http://www.icos-infrastructure.eu/?q=node/17 ). Both networks offer information, processing tools for calculating fluxes and experts for providing support for designing, establishing and running micrometeorological measurements. Micro-meteorological techniques for assessing GHG exchange are not recommended for smallholder systems due to the complexity of land uses and land management, small-scale gradients in soil fertility, and complex crop rotations with intercropping (Chikowo et al., 2014 ). Some literature for a first reading on micro-meteorological techniques is listed in Table 4.1. This technique allows measurements of GHG fluxes at fine scales, with chambers usually covering soil areas <1 m2, and are thus much better suited for smallholder farming systems. They can be operated manually or automatically (Breuer et al., 2000 ). Chamber measurements are rather simple and therefore the most common approach for GHG measurements since they allow gas samples to be stored for future analysis and, with the exception of automated systems, they do not require power supply at the site. In contrast with micrometeorological approaches, chambers are suitable for exploring treatment effects (e.g. fertilizer and crop trials) or effects of land use, land cover or topography on GHG exchange. However, care must be used in order to obtain accurate data, since installation of the chamber disturbs environmental conditions and measured fluxes might not necessarily reflect fluxes at adjacent sites if some precautions are not considered (see section 5.2.1 below). There are two types of chambers: dynamic and static chambers. For dynamic chambers the headspace air is exchanged at a high rate (>1-2 times the chambers volume per minute) and fluxes are calculated from the difference in gas concentrations at the inlet and outlet of the chambers multiplied by the gas volume flux, thereby considering the area which is covered by the chamber (Butterbach-Bahl et al., 1997 ). Static chambers are gas-tight, without forced exchange of the headspace gas volume, and are usually vented to allow pressure equalization between the chamber’s headspace and the ambient air pressure (e.g. Xu et al., 2006 ). The volume of the “vent tube” should be greater than the gas volume taken at each sampling time. Two situations call for using dynamic chambers: first, when measuring reactive gas fluxes such as soil NO emissions, and when there is a need to minimize the bias of changes in headspace air concentrations on the flux (Butterbach-Bahl et al., 1997 ). The second point is important, as significant deviations of chamber headspace gas concentrations from ambient air concentrations affect the exchange process between soils and the atmosphere itself, since the flux at the soil-atmosphere interface is the result of simultaneous production and consumption processes. For example, if N2O concentration in the chamber headspace is much higher than atmospheric concentrations, microbial consumption processes are stimulated. Moreover, since emissions are mainly driven by diffusion and gas concentration gradients, significant increases/decreases in headspace concentrations of the gas of interest will slow down/accelerate the diffusive flux. Both mechanisms finally result in a deviation of the flux magnitude from undisturbed conditions (Hutchinson and Mosier, 1981 ). It is important to be aware of this, though for practical reasons it is partly unavoidable because the precision of the analytical instruments used for gas flux measurements, such as electron capture detectors and gas chromatography, is insufficient to allow for dynamic chamber measurements. However, there are methods to cope with this problem, such as using non-linear instead of linear models to calculate fluxes as measured with static chamber technique (e.g. Kroon et al., 2008 ; Table 1), using quantum cascade lasers in the field (fast box; Hensen et al., 2006 ) and in general by minimizing chamber closure time as much as possible. Chamber closure time is affected not only by the magnitude of the gas flux but also by the chamber height. Therefore, in agricultural systems where plants need to be included for representative measurements, it is suggested to use chambers which can be extended by sections according to plant growth (Barton et al., 2007 ). Static chamber are usually mounted on a frame – which should be inserted (approximately 0.02-0.15 m) at least a week before first flux measurements to overcome initial disturbances of soil environmental conditions due to the insertion of the frame. Once the chamber is closed gas-tight on the frame, headspace concentrations start to change, either increasing if the soil is a net source (e.g. for CO2 – Fig. 2 ), or decreasing if the soil is functioning as a net sink (e.g. CH4 uptake by upland soils). For accurate calculation of gas flux a minimum of four gas samples from the chamber headspace across the sampling interval (e.g. 0, 10, 20, 30 min following closure) is recommended (Rochette, 2011 ). Gas flux measurements with static and dynamic chambers have often been described and Table 1 provides an overview of recommended literature, while Fig. 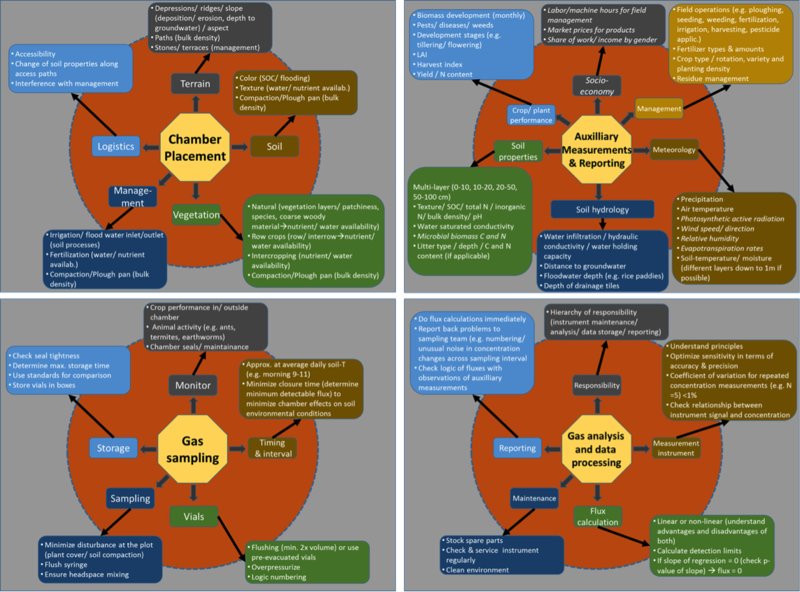 4.1  indicates important considerations when using chamber methodology. Static chambers can not only be used for measurement of soil N2O and CH4 and CO2 respiratory fluxes, but also for measuring net ecosystem exchange of carbon dioxide. The latter requires the use of transparent chambers and consideration of corrections for photosynthetic active radiation and temperature inside and outside the chamber (Wang et al., 2013 ). Chambers and changes in environmental conditions Closing a chamber gas-tight from the surrounding environment immediately affects a number of boundary conditions. The pressure inside the chamber might differ from the outside, because when chambers are gas-tight and exposed to sunlight, the temperature of the headspace air increases so that air pressure insight the chamber increases too. Both factors affect the gas exchange between the soil and the air. Thus, chambers should be heat insulated and opaque (except for the determination of net ecosystem respiration; see. Zheng et al., 2008 ) and a vent should be used (see Hutchinson and Livingston, 2001 ) to equilibrate pressure differences between ambient and headspace air. Upon chamber closure of transparent non-insulated chambers exposed to direct sunlight headspace temperature might increase by 10-20 °C within 20 min. Insulated chambers will also show a slight increase in soil headspace temperature. This affects microbial as well as plant respiratory activity. Therefore, minimizing closure times is necessary not only to minimize the effects of changing headspace gas concentrations on diffusive fluxes as described above, but to minimize temperature changes as well as (Table 4.1). One should therefore calculate the minimum flux that can be detected with the analytical instrument to be used and adjust the closure time accordingly. If possible, limit closure time to a maximum of 30-45 min. If automated chamber systems are used, change positions weekly or at 2-week intervals to minimize effects on soil environmental conditions, in particular soil moisture. Chambers have been shown to reduce soil moisture even if they open automatically during rainfall, (Yao et al., 2009 ). Chambers and spatial variability of GHG fluxes Soil environmental conditions change on a small scale due to differences in a) bulk density resulting from machine use or livestock grazing, b) texture as a consequence of soil genesis, c) management (rows, interrows, cropping), d) temperature (plant shading), e) soil moisture (e.g. groundwater distances or as an effect of texture differences), f) soil organic carbon (heterogenous distribution of harvest residues) or g) rooting depth and distribution (with effects on soil microbial diversity, activity and distribution) (see Fig. 4.1 ). For example, urine or feces dropping by livestock on rangeland or manure application to cropland has been shown to increase spatial and temporal variability of fluxes, since at plot scale not every patch responds equally to increased availability of substrate for microbial N and C turnover processes due to small scale differences in soil properties, soil environmental conditions and microbial activity and diversity. Overcoming spatial variability effects on GHG fluxes is a major challenge, specifically for highly diverse smallholder systems. The problem can be addressed by proper sampling design (Fig. 4.1 ) (see e.g. Davidson et al. 2002 ) or by using the gas pooling technique (Arias-Navarro et al., 2013 ) (Fig. 4.3 ). The gas pooling technique is similar to what is usually done for soil or water analyses. The principal idea of gas pooling is to generate a composite air sample out of the headspace of several chambers (Fig. 4.3 ). The chamber headspace is sampled at least 4 times across the closure period as is usually done, but gas samples at time 0, 10, 20, or 30 min are combined for several chambers for each individual sampling time (Arias-Navarro et al., 2013 ). As a consequence, information on the spatial variability is lost, but can be regained if on some sampling days fluxes of the chambers are measured individually. This technique allows installation of a significantly higher number of chambers without increasing the amount of gas samples to be analyzed. Due to its importance as a source for atmospheric CH4 we specifically discuss measurements of GHG fluxes in rice paddies in more detail. Unlike other field crops, rice is usually grown in flooded fields. The standing water creates anaerobic conditions in the soil that allows growth of a certain class of microorganisms (methanogenic archaea) that use simple carbon compounds (e.g. CO2 or acetate) as electron donors and produce methane in anaerobic respiration. Methane oxidation, on the other hand, does occur but only in the uppermost mm of flooded paddy soil or in the rhizosphere – due to radial O2 losses of rice roots (Butterbach-Bahl et al., 1997 ) – and during un-flooded periods. Since methanogenic archaea are extremely sensitive to oxygen and immediately stop CH4 production while stimulating CH4 oxidation, drainage of rice fields is an attractive mitigation option. Methane is the most important GHG in rice production systems and has some implications on the chamber design and sampling time. Nitrous oxide emissions are generally low in flooded fields but increase with drainage. However, this increase in N2O emissions does not off-set the mitigation effect that dry field conditions have on CH4 emissions (Sander et al. 2014a). Overall, requirements for GHG measurements of flooded rice production systems (dominated by CH4 emissions) are partly different from measurement at upland systems, which has some important implications on the chamber design and general sampling procedure (Table 4.2). Once per week or elaborated flexible schedule. 4.3.1 Rice chamber design and general procedure (see also Table 4.2) Methane that is produced in the soil has three different emission pathways to the atmosphere: 1) diffusion through the water layer, 2) ebullition (bubbling) and 3) transport through the arenchyma of the rice plants. The largest share of emitted methane (up to 90%) is in fact transported through the rice plant itself (Wassmann et al. 1996 ; Butterbach-Bahl et al. 1997 ), which makes it indispensable to include rice plants into the closed chamber ( chamber height >1m). This also applies to any measurements of wetland GHG fluxes, since plant-mediated transport is of critical importance here as well). The chamber base (the part of the chamber that remains in the soil during the whole growing season) should be installed at least one day (better a week or more) before the start of the sampling campaign and should not be higher than ~20cm (with 10 cm below and 10 cm above soil surface) in order to minimize an effect on plant growth. To account for variability within the field, each chamber should include at least 4 rice plants or 4 ‘hills’ in a transplanted system and an area of average plant density in a seeded system, resulting in a chamber area of ≥0.16m2. Note that due to the flooded field conditions, the chamber base in rice systems should have holes (~2cm above soil surface) to allow water exchange between the chamber inside and the field. This hole or holes must be closed before sampling in case irrigation water level falls and the hole(s) is above the water layer. Movement in the wet paddy soil can potentially cause gas bubbles to evolve and impede undisturbed gas sampling. Therefore, installation of boardwalks in the field is highly recommended. Exposure to high air temperatures and high solar radiation often characterize rice paddies and so it is in particular crucial to ensure that the plants inside the chambers are not damaged by heat stress during sampling. Therefore, the chamber material should be reflective or white or the chamber should be equipped with proper insulation. Since the gas volume in the closed chamber changes due to temperature increase and samples being taken, chambers should have a vent to allow equilibration with outside air pressure. 4.3.2 Time of day of sampling Methane emissions typically follow a distinct diurnal variation following changes in soil temperature (Neue et al. 1997 ), i.e. low emissions during night time that increase after sunrise, peak around noon to early afternoon and decrease again thereafter. Therefore the timing of gas sampling is of great importance in order to measure as close as possible at a time representing a daily average flux rather than at times leading to over or underestimation of fluxes. Minamikawa et al. (2012) found that methane fluxes around 10 a.m. were closest to the daily mean CH4 flux in temperate regions. Similar assumptions are likely valid for tropical and subtropical regions. However, we recommend measuring region-specific diurnal emission patterns at least three times during the growing season of rice and based on the observed diurnal patter to decide on the best sampling time. Alternatively, measuring diurnal soil temperature profiles at 5-cm depth can provide reasonable estimations of the time of day with mean methane emission as soil temperature and CH4 flux are closely related. 4.3.3 Sampling frequency The precision of cumulative seasonal GHG emissions largely depends on the sampling frequency. Minamikawa et al. (2012)  found that sampling once a week for flooded rice in temperate regions results to an accurate estimation of total emissions. Buendia et al. (1998)  proposed a more flexible sampling schedule of 10-day intervals in the beginning of the growing season, 20-day intervals in the middle and 7-day intervals at the end of the season in tropic environments and came up with similarly accurate seasonal emission estimates. It is important to note that more frequent sampling is necessary during dry periods of rice cultivation as methane emissions from paddy soils with a high clay content show a sharp peak when drainage is applied (Lu et al. 2000 ) and nitrous oxide emissions increase during dry periods (Jiao et al. 2006 ). In order to have complete flux information of an area, some gas samples should also be taken between two cropping seasons. When using the static chamber approach, several analytical instruments can be used for determining GHG concentrations in the sample air, either directly in the field or, following storage of headspace gas samples in vials or gas-tight syringes, at a later time in the laboratory. The latter always requires that the gas-tightness of the vials/ syringes is tested regularly. 4.4.1 Gas chromatography Instruments used for gas sample analysis rely on different operational principles. Gas chromatography (GC) is the most commonly used analytical technique when determining GHG concentrations in gas samples from chambers (e.g. Keller et al 1986; Kiese & Butterbach-Bahl 2002 ; Kelliher et al. 2012). Usually, 1-3 ml of air sample is injected into the gas chromatograph and the different compounds are separated on an analytical column (e.g. Hayesep N for N2O, 3 m, 1/8”) for detection with various detectors. For N2O commonly a 63Ni electron capture detector (ECD) is used. Please note that the ECD should be operated at between 330-350°C, since the N2O sensitivity is highest and the cross-sensitivity to CO2 is lowest in this range. However, there is still a cross-sensitivity to CO2 if N2 is used as sole carrier and purge gas (Zheng et al. , Wang et al. 2010 ). No cross sensitivity exits if Argon/CH4 is used as carrier gas or if the ECD cell is purged with a gas mixture of 5% CO2 in N2 (Wang et al., 2010 ). Another possibility to eliminate the cross-sensitivity of N2O and CO2 is to use a pre-column filled with Ascarite (coated NaOH), which scrapes the CO2 from the gas-stream. However, pre-columns need to be changed frequently (approximately 2 week intervals) due to saturation and capturing of air sample moisture. Another critical point is that if gas chromatographs with ECD are used for concentration measurements, the signal to concentration ratio might deviate from a linear response if – in the case of N2O – sample air concentrations are significantly >700 ppbv. Therefore, a check of the linearity of the signal to concentration ratio should be done for each instrument and gas under consideration. For CH4 a flame ionization detector (FID) is normally used and, if a methanizer is introduced before the detector, CO2 can also be measured with a FID (or more standard: use of a thermal conductivity detector for CO2). 4.4.2 Spectroscopic methods Spectroscopic methods are becoming more and more prominent for measuring GHG fluxes between soils and the atmosphere by static chamber technique. A specific example is the photo-acoustic spectroscopy (PAS), with instruments being miniaturized to make them suitable for direct field use, e.g. allowing direct measurements of changes in chamber headspace N2O, CH4 or CO2 concentration with time following chamber closure (e.g. Leytem et al 2011 ). PAS technique, as every spectroscopic method, is based on the principle that GHGs absorb light at a specific wavelength, here in the infrared spectra. The absorption is thereby directly linked to the concentration (Beer-Lambert law) and in the case of PAS, the absorption of the light or energy is converted to an acoustic signal, which is measured by a microphone. For chamber measurements in the field, the PAS instrument is usually connected to the chamber in a closed loop so that the air from the apparatus exhaust is returned to the chamber avoiding under-pressure or dilution. PAS instruments are becoming popular as an alternative to GC-technique due to portability, low maintenance, and ease-of-operation (Iqbal et al 2012 ). In principle, commercially available PAS instruments, such as INNOVA (Lumasense Technologies) require only a yearly calibration only and are “plug-and-play” instruments ready to be used in the field. However, because GHGs and water vapor have multiple absorption bands across the measuring spectra, such instruments are prone to interferences. Recently, Rosenstock et al. (2013) showed that for INNOVA instruments N2O concentration measurements were non-linearly affected by water content and CO2. Comparable results were already reported by Flechard et al. (2005) , though only a few researchers have noted the problems that might be associated with the use of PAS. The manufacturers claim that the INNOVA software accounts for cross interferences, but corrections do not seem to work sufficiently while testing several instruments (Rosenstock et al., 2013 ). Furthermore, there is also evidence that ambient air temperature affects the electronics and thus, the reliability of measured GHG concentrations (Rosenstock et al 2013 ), when using PAS under field conditions. Specifically for N2O, measured concentrations varied up to 100% depending on environmental conditions (Rosenstock et al. 2013 ). Also the precision and accuracy of CH4 measurements seems to be rather low, with deviations in concentration of nearly 400 % for calibration gases (Rosenstock et al. 2013 ). As it stands now, it is advisable to question the use of INNOVA instruments for CH4 as well as for N2O measurements in particular by using the instrument for simultaneous measurements of multiple gas species. Other techniques may include tunable diode lasers (TDL), quantum cascade lasers (QCL), Fourier transform infrared spectroscopy (FTIR) or cavity ring-down spectroscopy (CRDS). Instruments using these spectroscopic techniques usually operate under high vacuum and, thus, a continuous air flow through the instrument is required. Therefore, instruments need to be at the study site and physically connected to chambers. Though these instruments are still quite expensive (e.g. compared to GC) they are becoming more and more robust and suitable for field applications. However, a constant (use of UPS is suggested) mains power supply is still needed and checks for cross-sensitivity should be a standard procedure in the laboratory. 4.4.3 Auxiliary measurements As described earlier in this chapter, spatio-temporal patterns of GHG fluxes are closely linked to changes in environmental conditions (see also Fig. 1 ). Therefore, GHG flux measurements are rather useless if environmental parameters such as soil and vegetation properties and management are not monitored at the same time, since these factors significantly affect fluxes. This necessarily also includes the quantification of soil C and N stocks, as for example application of animal manure to arable fields and rangeland has been shown to significantly increase soil carbon stocks (Maillard and Angers, 2014 ), which needs to be considered when calculating the GHG balance of a given system. Moreover, since GHG flux measurements are expensive and can’t be repeated everywhere, models need to be developed, tested and finally used for estimating fluxes at landscape, regional and global scale as well as for exploring mitigation options at multi-year scales or for predicting climate change feedbacks on biosphere-atmosphere exchange processes. Comprehensive datasets, including both flux measurements and detailed information on soil and vegetation properties and management are prerequisites for model development and testing. Surprisingly such datasets are still scarce, because either flux measurements do not meet required measuring standards or the needed auxiliary measurements and site information are not monitored or reported. Since responsibilities for GHG flux and auxiliary measurements are often split between collaborators, there is a need to clarify personal responsibility of data provision prior to the start of measurements. Rochette and Eriksen-Hamel (2007)  reviewed published N2O flux data and developed a minimum set of criteria for chamber design and methodology. According to their evaluation of 365 studies, there was low to very low confidence in reported flux values in about 60% of the studies due to poor methodologies or incomplete reporting. Thus, it is necessary to improve not only the quality of flux measurements, but also the reporting of soil and vegetation properties and management. See Fig. 1 for suggested variables for measurement. For the quantification of biosphere-atmosphere exchange processes of GHGs micro-meteorological or chamber based techniques can be used. In view of the diversity and patchiness of landuses and land management associated with smallholder agriculture, chamber based methods, specifically the closed (static) chamber approach, is recommended. Overcoming spatial and temporal variability’s of fluxes remain an issue, and should be addressed by a well designed sampling scheme including landscape targeting of measuring sites (see Rufino et al., this book), targeting of chamber placement at field and plot scale (Fig. 1 ), running of at least 3-5 replicates per plot to address small-scale variability (and possibly use of the gas pooling technique, Fig. 3 ), flux measurements in weekly intervals over a period of at least one year and detailed documentation of environmental conditions and field activities (Fig. 1 ). This all will ensure that data can finally be used for modeling and upscaling. Quality control and quality assurance remains an issue at all steps, also with regard to gas analytics. Probably the most efficient way for a researcher to familiarize themselves with gas flux measurement techniques is a longer stay with a recognized research group. This work was financed by the SAMPLES project of the Climate Change, Agriculture and Food Security (CCAFS) research program of CGIAR Centres and Research Programs. Eugenio Diaz-Pínés received additional funding from the EU-InGOS project.